A few years ago I went to Disneyland on a mission. That mission was food. Glorious, delicious food. You see, I’ve been enjoying Disneyland pretty much my whole life. I went several times as an adult with my sisters and cousin. No kids, just four 20-somethings having a blast. I took a trip after the birth of each of my children. A mommy break sometimes is absolutely essential to keeping your sanity. 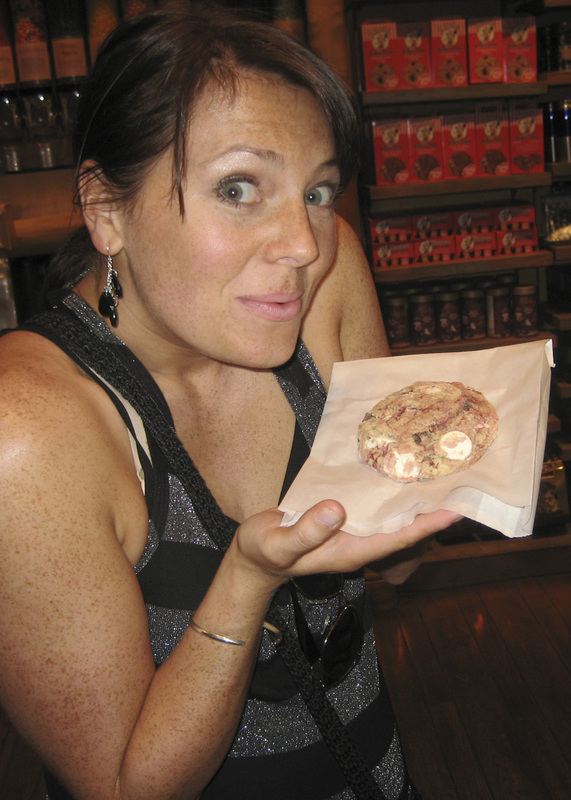 In all these trips however, I’d never truly realized the fabulousness of Disneyland food. Obviously there are things that are overpriced and a little bland (it is a theme park after all), but there are unexpected delights as well. I started reading Disneyland forums a few months before this particular trip. I was doing research (yes, it’s a sickness…I know) and compiling a list of all the great things people recommended consuming while at the Happiest Place on Earth. The list got very long very fast. Over 5 blissful days of appetite stretching, gluttonous eating I managed to taste everything on my list. Most items met or exceeded my expectations. One cookie blew me away. The forums just called it “the cookie”. This cookie. 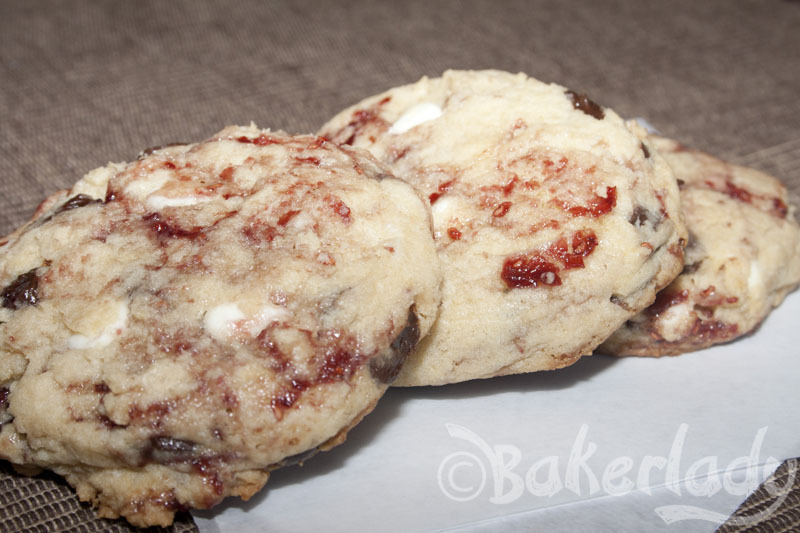 A light sweet dough with white and chocolate chips swirled with raspberry. Bliss. Usually when something is overhyped as being simply divine, the real thing doesn’t measure up. 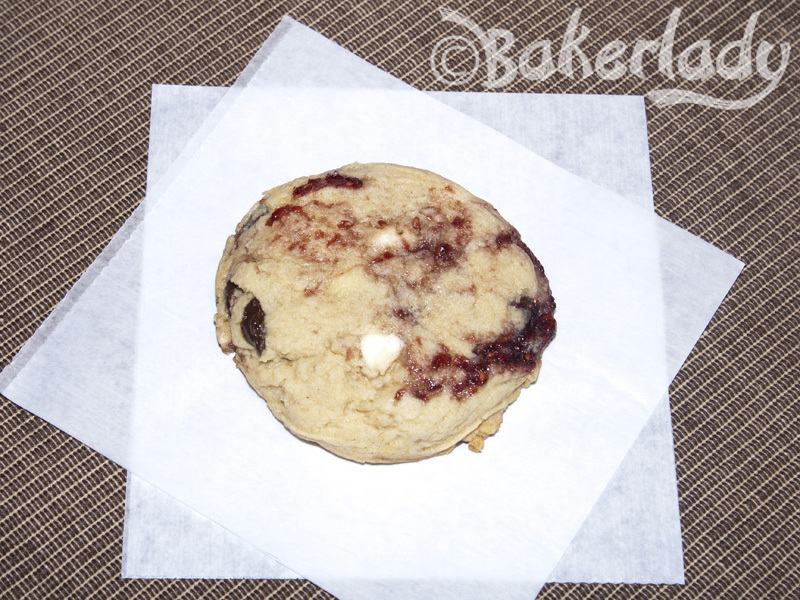 I cannot express to you how excited I was when at first bite I realized Disneyland’s White Chocolate Raspberry Cookie was everything I wanted it to be and more. It is beyond delicious. You can find it at Pooh Corner and at some of the shops on Main Street. Can you sense my joy at finally having one in my hands?? I’d heard that Disneyland will give you the recipe for things if you ask. Not true. At least, not true with this cookie. Perhaps because they don’t actually make it in the park. It’s made by a company called Selma’s. And they aren’t about to hand out their recipe (I can’t really blame them). Thankfully, my cousin Shannon (also a baker and a Disney freak) managed to piece together a close copy using Selma’s snickerdoodle dough as a springboard. 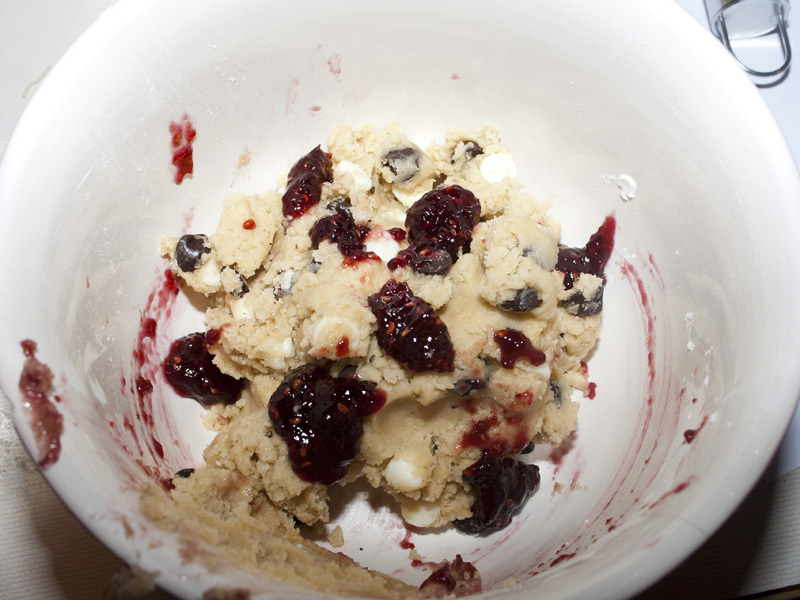 I tweaked her recipe a little, using almond extract instead of raspberry. I also used a trick I learned from America’s Test Kitchen and added an egg yolk for a super soft and chewy cookie. The result is pretty near a perfect match. 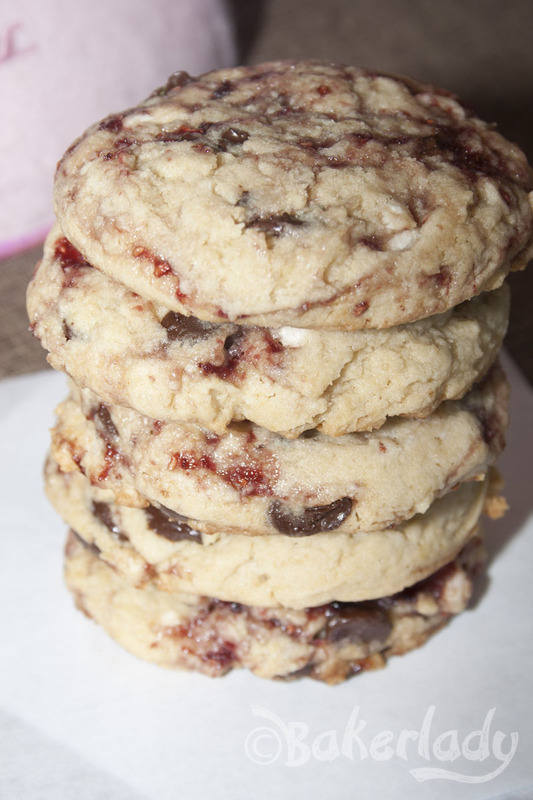 Big and chewy, swirled with raspberry and the sweetness of two kinds of chocolate. The only trick in making these is the swirl of raspberry. 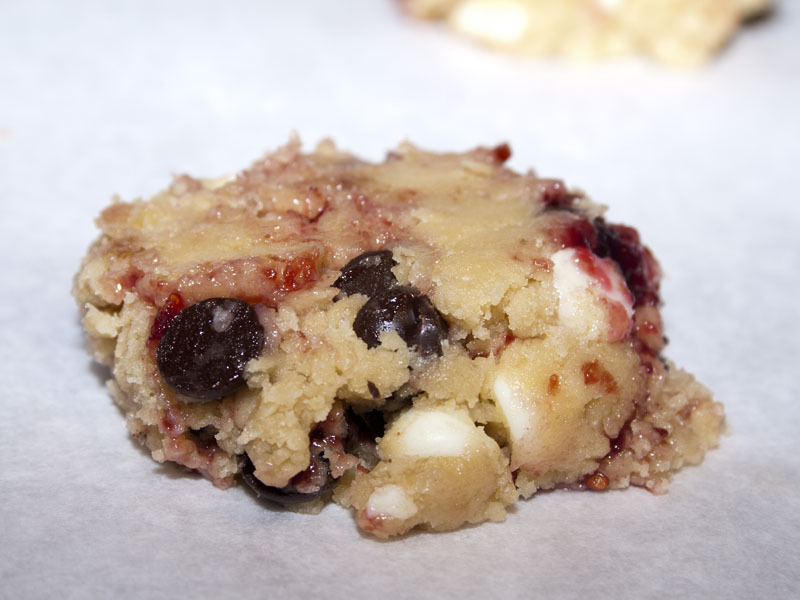 It is VERY easy to mix it too much and end up with a bright pink cookie instead of dancing raspberry swirls. Working 1/4 of the dough at a time is the key to getting the proper twirly action. Dollup about 1 tablespoon of jam over the top of one quarter of the dough. Then use a knife to sort of cut it in. Don’t stir! There should still be clumps of obvious jam. 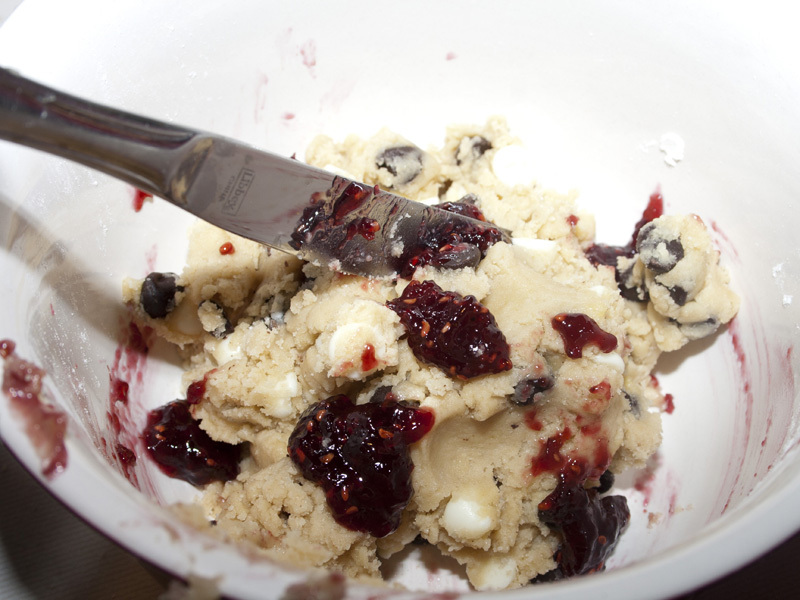 Then, using a cookie scoop, drop the dough on your prepared cookie sheet. Repeat with the remaining dough, working with one quarter of it at a time. 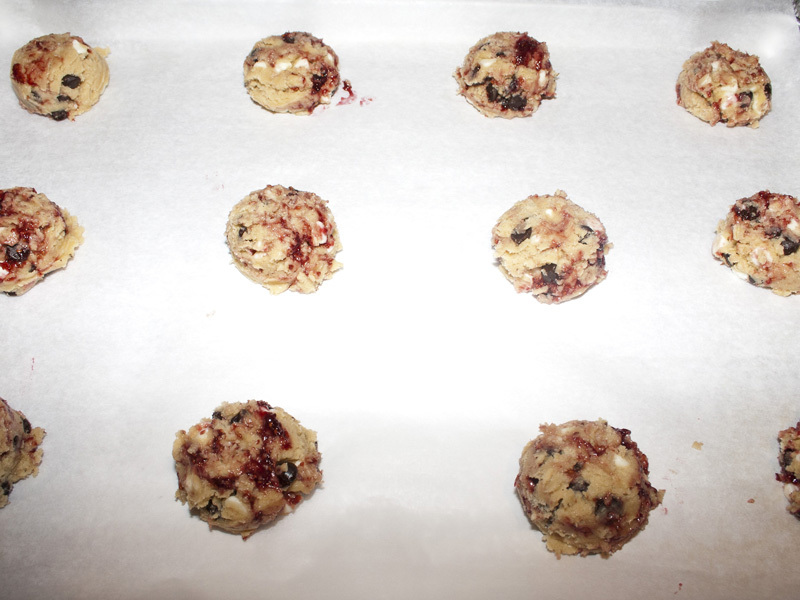 Depending on the size of your cookies, your bake time can vary from 8 minutes all the way to 17. I wanted mine to resemble the big bakery sized cookies they serve at the park. Only bake until the edges are faint golden and set. The middles will still be soft and puffy. 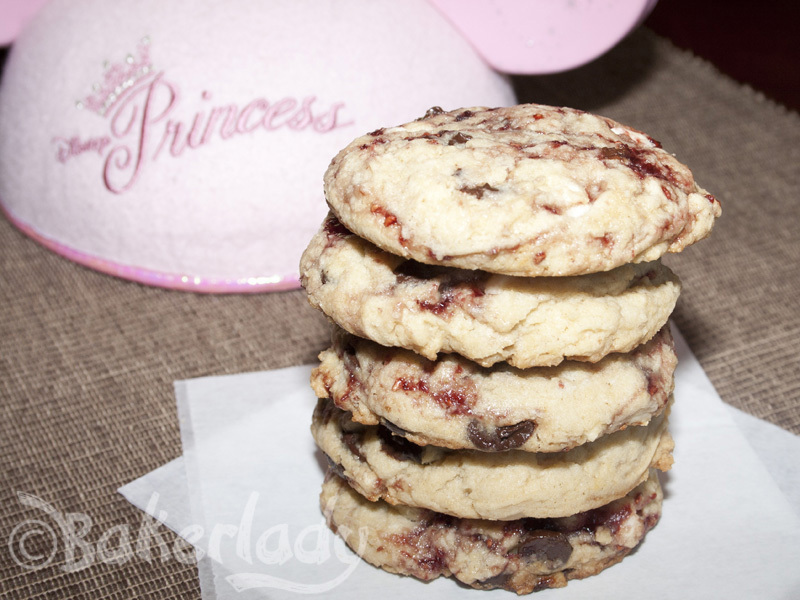 I can almost hear the faint screams of people going down Splash Mountain and the buzz of the pretend bees outside Pooh Corner as I eat these cookies. It was a vacation in my kitchen as the aroma of chocolate and raspberry started wafting out. At first bite I knew I was in deep trouble if I didn’t find someone to “gift” the batch to. 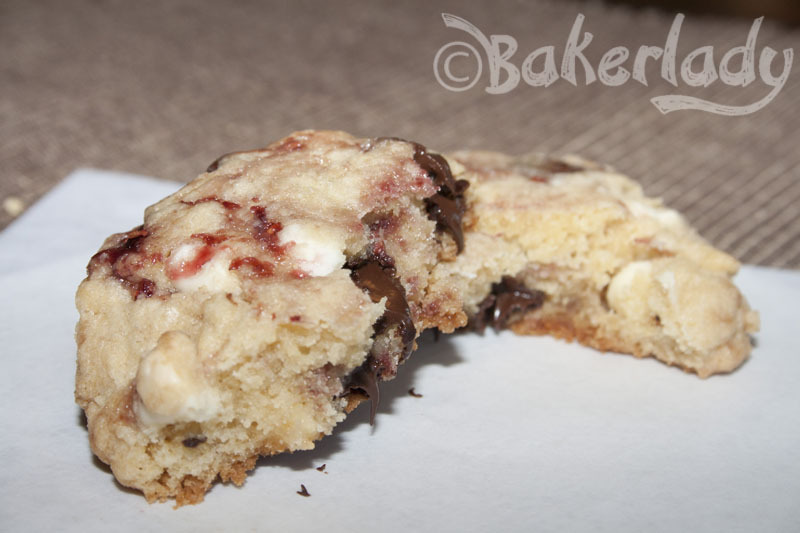 They were so soft and chewy and the flavor of the dough and the mixed in jam & chocolate was exactly right! If you’ve ever tried this treat in Disneyland and love it as I do, make sure you have people to help you eat these before making a batch. The temptation to sing Zip-a-dee-doo-dah while you consume the entire tray will probably be too great if you are by yourself with these. Partly because having another one isn’t going to cost you four bucks like it does at the Magic Kingdom! Without any monetary ramifications holding you back, there’s no telling what you might do. Seriously. 1. Cream the butter & sugars until light and fluffy. Add egg/yolk, vanilla and almond extracts. Mix well. Add dry ingredients and mix until just combined. 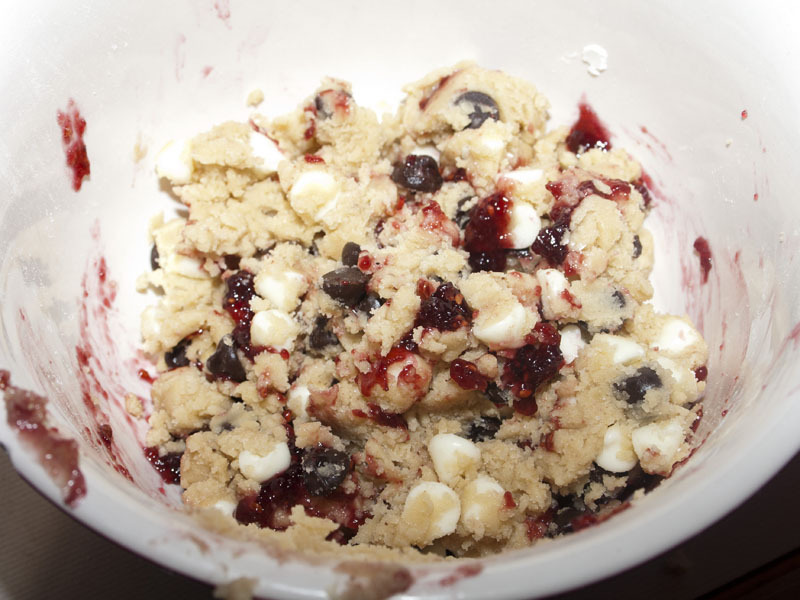 Add white & semi-sweet chocolate chips. 2. Scoop out about 1/4 of the dough into a smaller bowl. Add about 1 T of jam and cut it in using a butter knife. Be careful not to MIX it, or your dough will turn pink, you want more of a swirl. 3. 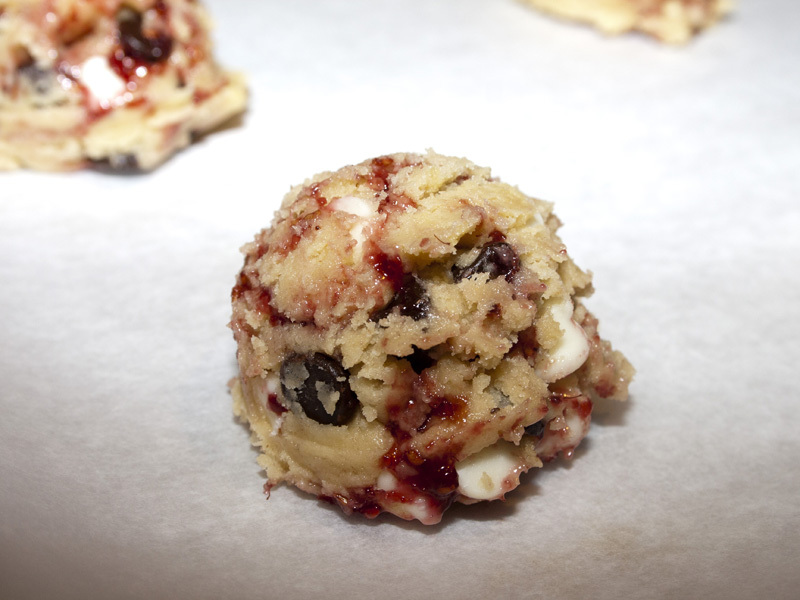 Take the jam swirled dough and scoop by spoonfuls (I used a large melon baller/ice cream scoop) onto a cookie sheet lined with parchment paper. Flatten slightly with the back of a spoon or spatula and place in a 350° oven for 12-17 minutes. 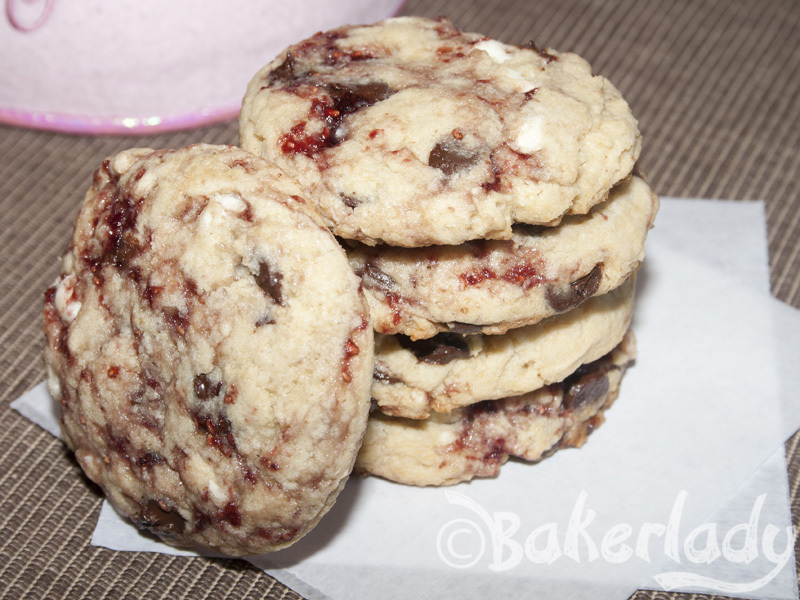 *Your bake time may be less depending on the size of cookie you make. I wanted mine big and bakery sized, so they took a little longer. Take them out when the edges are set but the center is still puffy and soft. Cool on baking sheet 5 minutes then transfer to a wire rack to cool completely. 4. Repeat steps 2 & 3 until all the dough is used.